Click the button below to add the Nature's Sunshine - SynerProTein - Chocolate (448g) to your wish list. 448g. 5-14 Day Supply. Suggested Use: Mix 1 well rounded scoop (32g) of Nature's Sunshine® SynerProTein® with 236ml (8 fl oz) of water, skimmed milk or juice. Blend, shake or stir vigorously, and drink 1-3 times daily. May be used occasionally as a meal replacement. Add fresh fruits to the blender to make your own favourite smoothie. Do not exceed the stated recommended daily dosage. Nature's Sunshine® SynerProTein® is an amazing low fat, high protein drink formula which combines non-GMO (non Genetically Modified Organism) soya protein, and the full range of essential amino acids, along with nutrients needed to rebuild muscle and reduce feelings of fatigue. Nature's Sunshine® SynerProTein® was originally formulated by Dr. James Scala, nutritionist to NASA and the US Olympic team, and thanks to sophisticated nutritional engineering, it will help you obtain complete, high quality vegetable protein without the calories, cholesterol and fat of other protein sources. Nature's Sunshine® SynerProTein® provides 18g of soya protein per serving, combined with Cruciferous Vegetables, Vitamins, Minerals and Herbs to aid absorption. Delicious Chocolate Flavour and only 121 calories per serving. Contains No: Dairy, Wheat, Gluten, Cholesterol, Yeast or Artificial Additives. 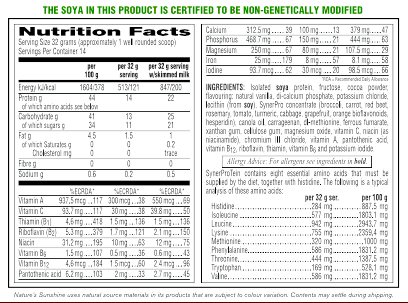 Ingredients: Isolated soya protein, fructose, maltodextrin, fenugreek, di-calcium phosphate, potassium chloride, SynerPro concentrate (broccoli, carrot, red beet, rosemary, tomato, turmeric, cabbage, grapefruit, orange bioflavonoids, hesperidin), canola oil, dl-methionine, vanilla flavour, magnesium oxide, lecithin (from soy), silica gel, vitamin C, ferrous fumarate, niacin (as niacinamide), vitamin A (palmitate), chromium chloride, pantothenic acid (as calcium pantothenate), thiamin hydrochloride, riboflavin, potassium iodide, pyridoxine HCI, and cyanocobalmin. Nature's Sunshine® SynerProTein® contains Vitamin A in the form of retinol. Pregnant women or those likely to become pregnant must not take more than one serving daily, except on the advice of a doctor or ante-natal clinic.